Located on the north-westernmost stretch of Africa and a gateway to Europe, Morocco is one of the most vibrant cultural and commercial crossroads of the continent. In the saddle explore Morocco's rugged hills and valleys of the Atlas Mountains. Venture into these highlands inhabited by the Berbers and be delighted by their proud traditions that have been passed down for millennia. Visitors who choose to explore the country will be impressed by its architectural and natural splendours, making Morocco a prime desert destination and also hotspot for Hollywood's film industry as several all-time classic movies like Gladiator and Lawrence of Arabia were shot here. 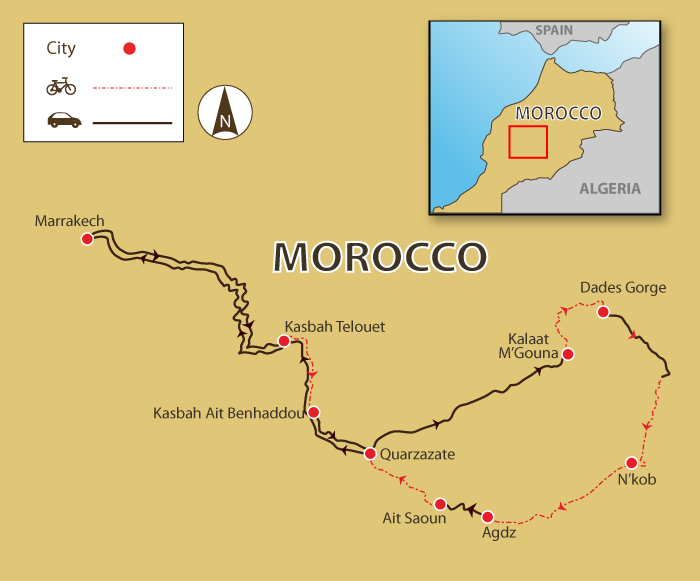 Explore this dynamic country and get the ultimate biking experience Morocco has to offer. Roll and pedal up and down the sea of red massifs and take in the captivating views of snow-capped peaks just a few miles further from the unforgiving desert, a contrasting picture of unparalleled beauty. Five days of biking take you through the realm of the legendary Atlas Mountains, the bone-dry Jbel Saghro and the life-sustaining oases and lush palm plantations of southern Morocco, making it a challenging yet rewarding biking experience. Upon arrival and after a trip briefing, we visit the Medina of Marrakech, a UNESCO World Heritage Site, with mazes of shops and stalls of succulent food and exquisite handicrafts before our welcome dinner. Drive via the Tizi n’Tichka Pass (2,260 m) to visit Telouet, home of Thami El Glaoui, Lord of the Atlas, and start biking to Ait Benhaddou, a UNESCO World Heritage Site featuring a 17th-century fortified complex. Transfer to an ancient troglodyte settlement and from Kalaat M'gouna, ride on dirt roads to Dades Gorges, between the Atlas and Jbel Saghro. Passing kasbahs built by the Berbers, we might take afternoon tea with locals. Winding through the Dades Valley, we ride to the heart of Jbel Saghro and cross the Tizi n’Tzazert Pass (2,200 m) with breath-taking panoramic views. Then swoop down for a night in N’kob, a lush Berber oasis town at the foot of Jbel Saghro. We ride through Morocco's largest date palm groves of the Draa Valley. We explore on local dirt tracks the serene Berber villages along the Draa River and spend the night with a local Berber family. Witness the beauty of the Draa Valley, and in Ait Saoun, ride through a most scenic valley with traditional villages sitting in lush oases. Transfer to Marrakech on one of the most beautiful roads on earth. Visit Bahia Palace and the exquisitely decorated Saadian Tombs of the Saadi Dynasty. Then through the maze of stalls of DJeema el-Fna, walk, eat, and shop before returning for a farewell dinner. Transfer for your onward travels. Day 2 - Marrakech - Kasbah Telouet - Kasbah Ait Benhaddou Ride 47km. +413m / -924m. An amazing way to experience the colors, sights, people and landscape of Morocco! Morocco exceeded our expectations in how friendly it was to tourist and cyclists in particular. I wouldn't hesitate to return and do more cycling and soak in more of its lovely culture, people, and landscape. Serendipitous grouping of people. It was a pure treasure getting to meet our new friends from Milwaukee, USA, Saipan, USA territory, and merry old England. The tour was set up perfectly with local tours, food, and sleeping accommodations. Everyone with SpiceRoads was delightful especially our bike guide, driver and support vehicle staff. We miss them all!!! On this mountain biking adventure, we will cycle 264 km in 5 days of riding. This is a moderate trip, and riders with reasonable levels of physical fitness should enjoy the entire trip. Our journey starts in Marrakech, the ancient walled city bustling with activities as well as a commercial crossroads for centuries. In addition, this UNESCO World Heritage Site also abounds with shops and stalls featuring exotic food and refined handicrafts awaiting shoppers to savour and test their purchasing techniques. Suitability: With a few exceptions on tarmac, the cycling takes place on unpaved roads, so we recommend that cyclists be reasonably fit and confident riding on rough terrain. However, as this trip is fully supported, weary cyclists can take breaks in the support vehicle if required. Biking Conditions: The off-road portions of this trip are complimented by swift and long downhills, and while the ride is generally not too demanding, some parts of the route consist of loose gravel and sandy patches that could prove hazardous to riders. Additionally, some of the descents can be rocky, which requires extra caution and some off-road biking skills. Upon arrival in Marrakech, we transfer to the riad and meet up for a trip briefing. We then take a city tour to visit the Medina of Marrakech, a UNESCO World Heritage Site featuring a maze of shops and stalls selling succulent traditional food and exquisite handicrafts. After our explorations, we have dinner in a restaurant near the Jemaa El Fena Square. This morning we leave Marrakech early and head to the UNESCO World Heritage Site of Ait Benhaddou, an ancient fortified community and trading post that features pre-Saharan earthen architecture dating back to the 17th century. Driving via the Tizi n’Tichka Pass (2,260 m) to Telouet, where we start our mountain biking adventure, stopping to visit Glaoui Kasbah of Telouet, the home and stronghold of the Lord of the Atlas during the French occupation, Thami El Glaoui. From Telouet, the ride takes us through scenic tiny Berber villages and up and down the Ounila Valley. We wind our way to visit the stunning Kasbah village of Ait Benhaddou, where we stay the night in one of the many riads. We rise early today to ride the longest yet most exhilarating leg of our biking expedition. Leaving Ait Benhaddou behind, we transfer for 90 minutes, stopping to visit an ancient troglodyte settlement. We start riding from Kalaat M'gouna on dirt roads and will likely see nomads tending their flocks as we make our way to Dades Gorges, which lies between the High Atlas Mountains and Jbel Saghro Mountains. Our cycling route will take us by dozens of kasbahs, or fortresses, built by the Berbers as defenses, perched precariously on the cliffs. We will also come across Berbers who are living in caves that have been handed down for generations. If invited, we'll stop for a refreshing cup of mint tea and learn more about their culture. Our day ends in the stunning valley at a riad. We cycle to the Berber oasis town of N’kob. This scenic route snakes through the Dades Valley as we wind our way to the middle of the Jbel Saghro. We climb to cross Tizi n’Tzazert Pass (2,200 m) or get a lift up to the top, all the while enjoying stunning panoramic views in every direction. Rest your legs a little here before cruising downhill to spend the night at the lush Berber oasis town of N’kob, which sits at the foot of the Jbel Saghro Mountains and abounds with palm plantations. Continuing our bike exploration of the Moroccan desert, we ride to the lush and seemingly endless date palm groves of the lovely Draa Valley – the largest date palm groves in Morocco. Following local dirt tracks, we make our way into the heart of the oasis to explore the palm groves and the small Berber villages lining the banks of the Draa River, the lifeblood of this fertile area. We will spend the night with a local Berber family. After breakfast, we drive to explore and witness the beauty of the Draa Valley. We transfer for 25 minutes to Ait Saoun, where we get in the saddle and ride for 30 km through one of the most scenic valleys of Morocco. The ride takes us past a succession of traditional villages lying in green oases. After lunch, we transfer back to Marrakech via the Tizi-n-Tichka Pass. At 2,260 m above sea level, it is a spectacular piece of engineering by the French that is often listed as one of the most beautiful roads in the world. Dinner is on your own in vibrant Marrakech. It's a bike-free day, and we relax our muscles by taking a guided tour of Marrakech, the Southern Pearl of Morocco, to learn more about the city's rich history and culture. Discover the Palace of Bahia, built the late 19th century. It consists of 160 rooms and meant to be the grandest palace of the time. Next, we visit the Saadian Tombs, the exquisitely decorated and sculptured mausoleum of the Saadi Dynasty members, who ruled Morocco from 1554 to 1659. And we continue the tour to the 69-m Koutoubia Mosque, the city's most famous and largest mosque, and to the nearby square Djeema el-Fna, a bustling square full of shops and stalls where you can practice your bargaining skills. 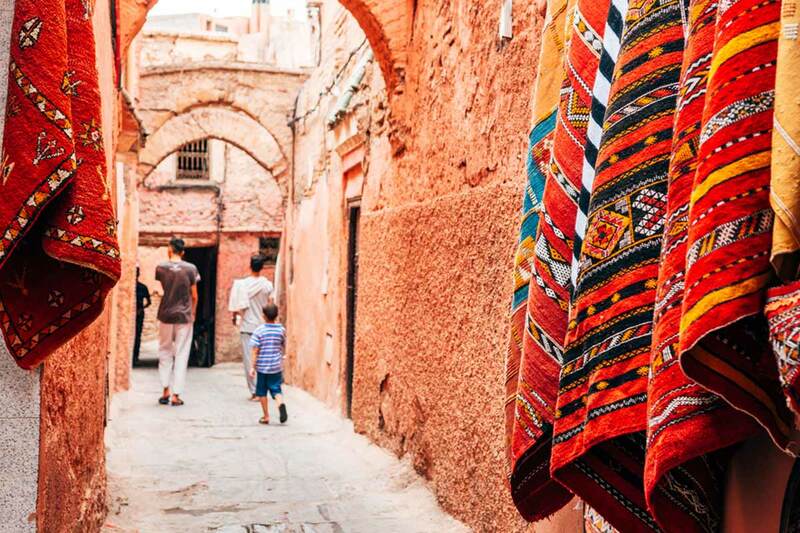 The tour concludes with an exploration of the souk (market), filled with mounds of spices, intricately woven Berber carpets, ceramics, hand-made leather goods, and tantalising food stalls. Lunch is on your own, but we will meet up for a farewell dinner to reminisce on our magical time in Morocco. Because some people can't imagine going on a trip without their own beloved bicycle, we do not provide them as part of this tour. However, you can hire bikes locally for the price listed in the tour pricing section. The bikes are well-known makes mountain bikes with lightweight alloy frames, 24- to 27-speed gearing, v-brakes, and Shimano components and front suspension. If you bring your own bike, please make sure it is a mountain bike, preferably with front suspension, in good mechanical order. Please make sure you have a passport valid for at least six months before your departure. While a visa must be obtained for foreigners wishing to enter Morocco, it is not required for all North American, most European, Australian and New Zealand nationals and they are able stay in the country up to 90 days. For more information, visit here for the full list of eligible countries. There are no compulsory vaccinations although it is strongly recommended that you are vaccinated against: Typhoid; Hepatitis A and B. Tetanus and polio vaccinations should also be up to date at the time of travel. Please speak to your doctor/physician for the most recent information. Morocco has a sub-tropical climate with temperatures between 18C and 28C, although they can soar to 35C in the summer and fall to as low as 5C in the winter. However, the weather varies from region to region due to the country's geographical setting. Bordered by the Mediterranean Sea in the north and the Atlantic Ocean in the west, the country enjoys a moderate climate with a warm winter as a result of the sea breezes. On the other hand, its eastern and southern parts are very dry and hot all year round as they are surrounded by the scorching Sahara Desert, while the Atlas Mountains which snake from south to north and divide the country in half make the climate in the central more extreme with unforgiving heat in the summer and freezing temperature in the winter. Therefore, the best times to visit are from March to May and from September to November, when the weather is generally dry and warm. Meals are included in the itinerary as B = breakfast, L = lunch, and D = dinner. Most meals will be prepared by the cooking team on the support staff and feature Western-style cuisine with a sampling of Moroccan food. Any special dietary requirements can also be catered for as well. Please let us know at the time of booking. Keeping you completely hydrated is a job we take very seriously. Cold water, some energy-restoring local fruit are included in the tour price while riding. Soft drinks and other beverages during meals are not included. Beer and alcohol are NOT included in the price. We recommend that you tuck away a few extra dollars, say 20, a day for incidentals. Included entrance fees are those for the listed sites and national parks that are part of the itinerary. Any other site fees are not included. Morocco's currency is the Moroccan dirham (MAD), and although the dirham is officially the only accepted currency, some hotels and restaurants may also take EUR/ USD for payment. While exchange rates are generally the same at all banks and official exchanges, there are also “unofficial” places to get the dirham, but be sure to check the rate first to prevent an unfair deal. While ATMs can be found in major cities' chain hotels and modern shopping centres, make sure that the ATM accepts your cards (look for the Maestro, Cirrus or Plus logos). However, don't expect to see many banks in the souks or medians, and try to have as much small change as possible as well as putting large bills in separate pockets. In Morocco, credit cards are accepted by only a limited number of businesses, and those who do are likely to accept Visa or MasterCard with a surcharge for the transaction. Most important, before leaving Morocco don't forget to exchange the dirhams into major currencies as it will be worthless elsewhere, and it is also illegal to take more than 100 dirhams outside the kingdom.